Ramekins, the universal bowl for pop-overs! Yet there is so much more this vessel can be used for; kitchen prep bowl, condiment dish, safe place for jewelry by the sink or bed AND pair it up with one of our platters or bakers for dips and turn it into an appetizer tray/platter to keep thinks either hot or cold for longer! Measures 3 3/4" x 2" and holds ~6 oz. Still created in the Old-World style by using hand cut sea sponge to "dot" the artists designs (somehow in a straight line!) onto each piece free hand. Brushwork is added where needed in the more complex designs. The only extra tool they use is a lazy-susan to turn each piece. All our Polish Stoneware can be used from fridge to table. Safe in oven temperatures to 450 degrees, dishwasher and in the microwave. It is best to let refrigerator or freezer pieces come to room temperature before placing in the oven. There are thousands of patterns and designs that range from traditional (the classic patterns) to Unikat (or Signature) patterns which are signed by the design artist. This pattern is created in the world-renowned Ceramika Artystyczna factory in Boleslawiec, Poland. FREE shipping and returns, 100% satisfaction guaranteed! 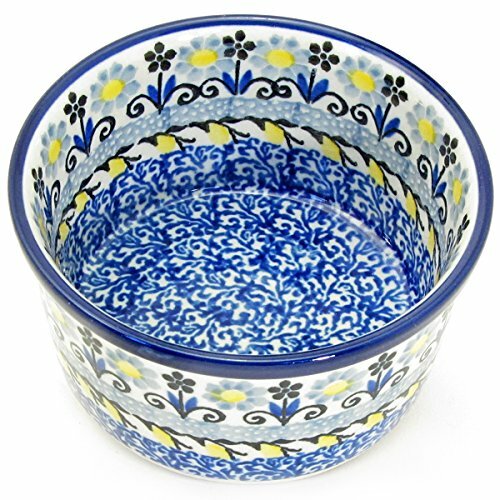 If you have any questions about this product by Polish Pottery Boleslawiec, contact us by completing and submitting the form below. If you are looking for a specif part number, please include it with your message.